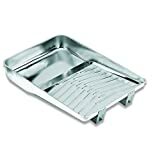 AzBaja.com, Home of the VW Baja Bug -:- BizStore » Tools » Wooster Brush R402-11 Deluxe Metal Tray 11"
BizStore » Tools » Wooster Brush R402-11 Deluxe Metal Tray 11"
Our most popular tray, used by professionals and do-it-yourself painters. Deluxe-quality, made of rust-resistant steel. Durable welded legs keep the tray level. Use a form-fitting liner (R406, BR496, or BR407) for instant cleanup. The Wooster Brush Company has been manufacturing innovative, high-performance painting products right out of Wooster, Ohio USA since 1851. You can feel confident knowing Wooster is the name behind your tools. • 4 Piece Angle Sash House Paint Brush Set.Used By Professional Painters and Home Owners. Wall Paint Brushes, for Decks,Fences,Trim,Interior and Exterior. Commercial or Residential Paint Brush Set.